A must to get. 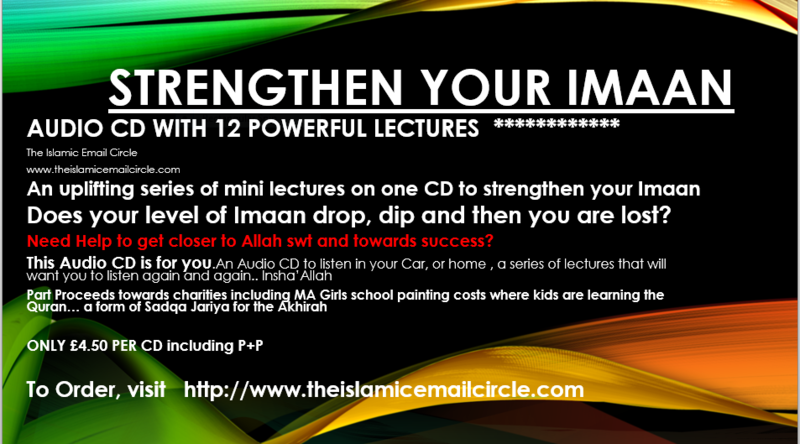 Strengthen Your Imaan is for those who want to listen to mini lectures to help them uplift their Imaan to a new level. A combination of 12 Mini lectures on 1 CD to help improve on your Imaan and to give you that inner peace that you have been looking for. MA Girls School is a purpose made building helping the poor and needy kids in a village in Pakistan to learn the beautiful words of the Quraan and Islamic Studies.